Caroline Love Goodwin was most likely born in 1869, although the exact year of her birth is not known. As the daughter of a socially important family in Georgia, she attended the Lucy Cobb Institute and graduated in 1886. After briefly studying art in New York City, she sailed for Europe and supported herself as a freelance artist for the next eight years. While in Europe she met Daniel O'Day, an oil businessman, and in 1901 the couple returned to New York where they married. O'Day remained quietly married to her husband for the next fifteen years, but his death in 1916 released an interest in activism that had lain dormant while a wife and mother. She became committed to issues of social welfare and woman suffrage and as a wealthy widow, O'Day was able to use her financial assets to further these causes. She also became active with the New York Consumer's League, the Women's Trade Union League, and the Democratic party. In 1923, she was appointed to the New York State Board of Charities, and later that year she became closely allied with other prominent social activists that included Nancy Cook, Marion Dickerman, and Eleanor Roosevelt. 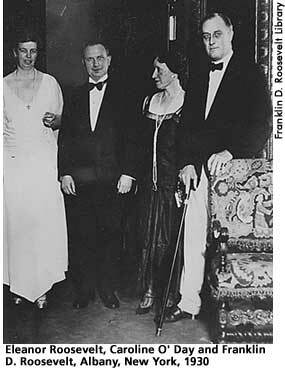 O'Day quickly became an ardent supporter of Franklin Roosevelt, and her assistance in FDR's presidential campaign of 1932 was reciprocated when the president and the first lady helped her win a congressional seat in 1934. In the House of Representatives, O'Day championed the New Deal, devoted much of her time to immigration issues, and quickly became one of the most prominent women in Congress. Just as she had opposed American involvement in World War I, she had misgivings about deepening American commitments to Europe in the late 1930s. Nonetheless, she remained loyal to the White House on almost every issue, even when it became clear that the United States was becoming more deeply entangled in World War II as a result of FDR's policies. O'Day, however, would not live to see the Axis powers defeated. She became seriously ill in 1942 and died in January 1943. American National Biography. New York: Oxford University Press, 1999, 615-616. Lash, Joseph. Eleanor and Franklin. New York: W.W. Norton & Company, 1971, 418, 426, 448, 686.